The short answer is, to save space and money. However, the importance of warehouse design layout is much more in-depth. Warehouse management affects employee productivity, ease of access, and even storage capacity. An improper or poorly-planned warehouse design layout will not utilize all available space, and may even consume more space than it should. Ideally, an effective design will make smart, closely-calculated use of current needed space. It should also plan for future use of available storage space, both horizontally and vertically. If your employees have to travel a long distance between point A and point B, or have to go through a lengthy process to retrieve or store anything, it will harm productivity. A solid floor plan will have storage and space aligned so that areas that need to be frequently accessed together are nearby and free of hold-ups. This goes hand-in-hand with space and productivity, but is equally important on its own. 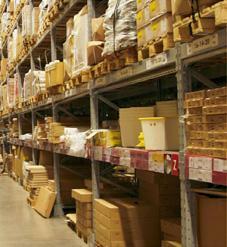 Organization within a warehouse facility is fundamental for smooth operation. Think of it this way: the more time spent locating something, or find a place to put something, the more it costs you. In order to get everything done in the minimal amount of time, organization must be a priority. Warehouse management and design logistics aren’t simple. A facility owner can’t just sit down for a few minutes and draft up a plan, although it would be nice. It requires time, precision, and expertise in the most effective ways to organize warehouse storage. Luckily, S.W. Betz can do this for you, saving you time and money! This entry was posted on Tuesday, February 23rd, 2016 at 11:00 am. Both comments and pings are currently closed.